Men work during the week in often illegal gold washing sites among Amazon. Diesel engine pumps water with high pressure and hoses are used to attack soil. Water loosens it and it flows to structures made of rain forest trees cut down for the purpose. The wash towers contain boxes that are covered by small mats. Men pour mercury from small plastic bottle over the washed soil and rubs the mixture with bare hands. Running water removes the mud and mercury ties the gold dust into the mats. Water continues flowing eventually reaching branches of Amazon river. The men use tea spoons to scrape the gold dust into a bowl carefully adding also every nuggets they find. After hard work of a week or two the men walk jungle paths or use their canoes to reach Wild West towns, that have been haphazardly built here and there. Now is time to get things, diesel oil for the pumps, mercury from Brazil, food and other necessities. Gold is valid currency here but if there is enough some of it is changed into cash at local shops and sent to wife and kids far away. Airplanes land and take off in some of the many unofficial strips bringing necessities and taking things and people back to the big cities. Now is the time to relax in bars, seek female company, laugh, dance, drink and enjoy life until morning and return back to harsh work in the rainforest. Gang fights are often bloody, .38 guns send men to their deaths and to simple burial in nearby forest where the body decomposes in a few days. Gold washers attract women who arrive to the Wild West towns even from far. They include mothers from Brazil, lonely teenager from Surinam, local daughters from French Guiana families seeking for income. There are enough clients. Some women have legitimate work as cooks in the hotels, shop keepers, pharmacists or postal workers. Some just hang out bored waiting for the week-end action. The number of prostitutes is significant among the women. Gold dust is local currency and a popular girl may get 4 or 5 grams for the services. Evening in bars, dancing places can be profitable if you do not concentrate on a single nice guy. Many of these women suffer from home-sickness, eyes are sad despite the smile on the lips, husband and children are there far-away and occasionally get some money from the gold fields. The business is not that profitable and after a year or two the women long home if they just had the money to travel. Wild West life in modern rainforests of Amazon. 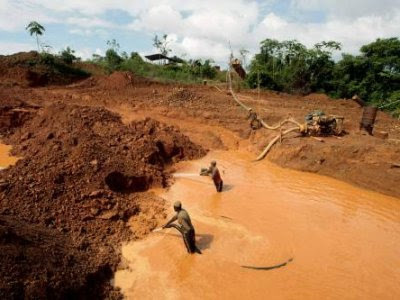 Dangerous to life, mercury poisoning, devastating forests, eventually deadly fish that cause medical problems to Amerindian children and also make the gold diggers themselves sick. For each 50 kg of gold brought from Amazon jungle people introduce 20 kg mercury into the nature. How wonderful it was to see preachers in these towns talking about Jesus to these people in the midst of heavy work, murder, adultery, drugs and deadly poisons. "Não acumulem para vocês tesouros na terra, onde a traça e a ferrugem destroem, e onde os ladrões arrombam e furtam. Mas acumulem para vocês tesouros nos céus, onde a traça e a ferrugem não destroem, e onde os ladrões não arrombam nem furtam. Pois onde estiver o seu tesouro, aí também estará o seu coração. 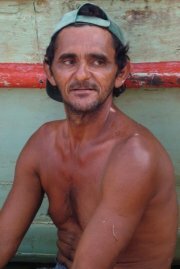 “Os olhos são a candeia do corpo. Se os seus olhos forem bons, todo o seu corpo será cheio de luz. Mas se os seus olhos forem maus, todo o seu corpo será cheio de trevas. Portanto, se a luz que está dentro de você são trevas, que tremendas trevas são!" “The eye is the lamp of the body. If your eyes are healthy, your whole body will be full of light.But if your eyes are unhealthy, your whole body will be full of darkness. If then the light within you is darkness, how great is that darkness! This text is a thankful comment on the exceptionally fine multiple awards winning documentary by Olivier Weber Cursed for Gold (TF2 2008).